David Fahrenthold of the Washington Post wins the October Sidney Award for a stunning series of scoops about Donald Trump’s misuse and mismanagement of his personal foundation and his degrading and abusive comments about women. 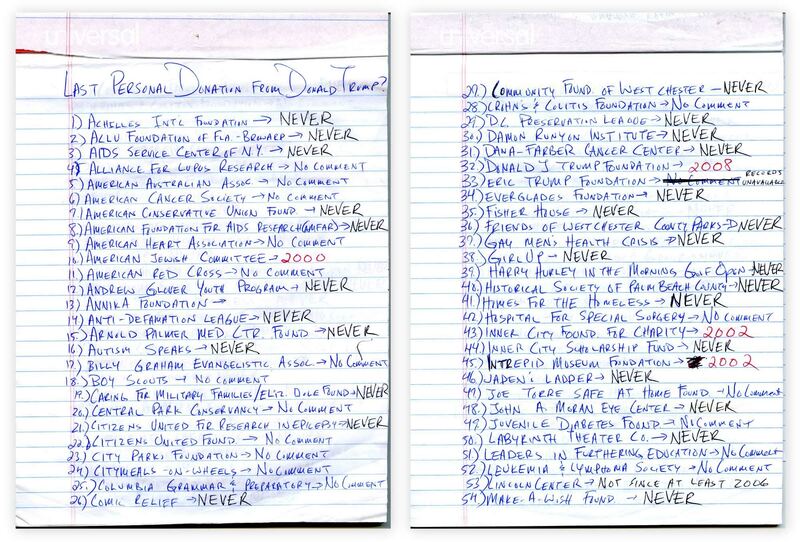 Fahrenthold’s investigative odyssey began when Trump skipped a GOP debate to hold a charitable event which he claims raised $6 million for veterans, including a $1 million donation from his own pocket. Fahrenthold set out to determine whether Trump had actually turned over the cash. He hadn’t. Months later, national media pressure finally forced him to pay up. Fahrenthold kept digging and discovered that the Donald J. Trump Foundation lacks the certification to solicit money from the general public, despite having collected millions from outsiders over the years, prompting the Attorney General of New York to freeze the organization’s fundraising. Trump bills himself as an “ardent philanthropist” who has given huge sums to charity, but Fahrenthold’s exhaustive reporting turned up little evidence to support those claims. Instead, he unearthed ample evidence that Trump uses his charity to benefit himself: Trump used $258,000 from his foundation to settle legal problems. He also spent $10,000 of the foundation’s money on a portrait of himself that now hangs in one of his Florida resorts. Trump also had creditors pay his foundation $2.3 million to settle debts owed to himself or his businesses, but he refuses to say whether he paid taxes on the money. The notorious 2005 NBC tape of Trump boasting about sexual assault was another Fahrenthold scoop, which prompted prominent Republicans to withdraw their support for Trump and sparked widespread public outrage. Fahrenthold is covering the 2016 presidential election for the Washington Post. He has worked at the Post since 2000, and has covered beats including the D.C. police, the environment, New England, Congress and the federal bureaucracy. He is 38 and lives in Washington, D.C..
Q: How did you find yourself covering the Trump Foundation? It started in late January, when Donald Trump skipped a Fox News-hosted GOP debate and instead held a televised fundraiser for veterans’ charities in Iowa. Trump said he’d raised $6 million that night, including a $1 million donation from himself. In the weeks after that, I became curious about whether Trump had actually given the money away to veterans, as he’d promised. It seemed like a simple story. It wasn’t. I spent weeks and weeks looking for answers, and getting few. Finally, we learned the truth: Trump *hadn’t* actually given away the $1 million from his own pocket, even though his campaign said he had. And he was still sitting on more than $1 million that other people had given to the Donald J. Trump Foundation, in the belief that Trump would quickly pass it on. Finally, under media pressure, Trump gave all that money away in late May. He then held an angry press conference, in which he lashed out at the media for badgering him about where the money had gone. We thought: If this is how Trump handles charity money when everybody is watching, how had he been handling it earlier, when almost nobody was watching? Q: What advice do you have for reporters covering nonprofits? Learn the law. This is probably a very obvious piece of advice for most charity reporters, but – for a newbie like me – the laws governing charities are complex, and not always intuitive. After I really learned about them, I often realized that I’d learned about examples of prohibited behavior at the Trump Foundation – like self-dealing – months earlier, without actually understanding what I’d found. Q: Of all the scoops you’ve generated on this beat, which are you most proud of, and why? A: Discovering the $10,000 portrait of Trump – which Trump had bought with charity money – on the wall of Trump’s Doral golf resort in Miami. It wasn’t the most earth-shattering discovery: I’ve found other examples of self-dealing by Trump, in which the dollar figures were much higher. But I really enjoyed this story because of its scavenger-hunt aspects, and because of all the help I got from friendly strangers. I only learned of the portrait’s existence because of an anonymous phone call from Palm Beach: a woman I didn’t know called me to say “Google ‘Havi Art Trump.’” That Google search led me to a charity, Unicorn Children’s Foundation, which confirmed that Trump had once paid $10,000 at one of their charity auctions, for a portrait of himself painted by artist Havi Schanz. The money came from Trump’s foundation, not his own pocket. Then, after we posted a picture of the portrait, a Twitter follower of mine – @alkaguilar – searched the 380-plus photos posted on the TripAdvisor page for Doral, and found one that showed the charity-purchased portrait on the wall of the resort’s bar. That photo was dated February 2016. Then, after I tweeted out this find, a Univision anchor named Enrique Acevedo – whose studios are located just blocks from Doral – booked a room for that night. After his newscast ended at midnight, Acevedo went to Doral, roamed the hallways, and talked his way into the closed bar. There was the portrait, still hanging on the wall. The scavenger hunt that began with an anonymous tip from one of my readers ended with a triumphant Tweet from another.